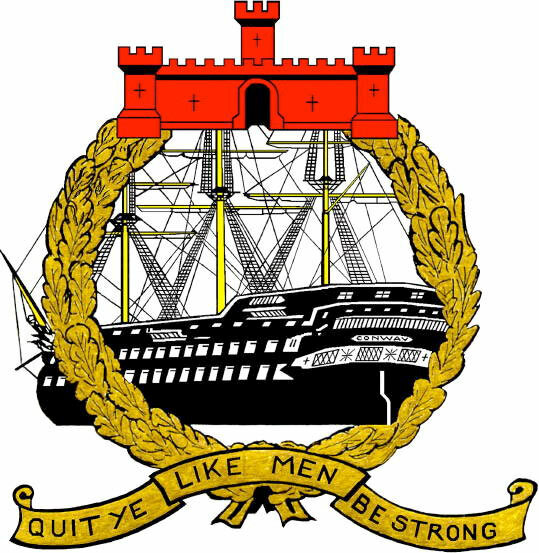 This was Richard's first ship as Chief Officer. He joined, aged 27, in Houston July 26, 1973 and on March 9th 1974. 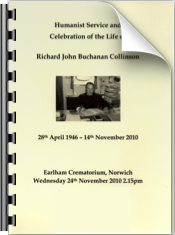 Made Redundant by Bank Line Ltd.
Richard's Funeral was a Humanist Celebration of Richard's life, lead by John Hemlsey with a eulogy by Stephen Hornby. The order of ceremony for Richard's funeral. Written on the back of the photo is "John and Richard at Glasgow"
Richard Collinson playing with unknown friend. Jack was given to me - as a puppy - by my grandmother "Ju" when I was a year old. He lived until I was 18 years old. And was my best friend, confident and playmate throughout my childhood. This photograph was taken just before I joined the Pre-Sea training school "HMS Conway" I would have been about 15 years old. At this time the demands of his job required my brother to be away from home, family and friends for incredibly long periods. Everyone who knew him was the recipient of postcards, letters and gifts from all parts of the globe. Richard sent or rather 'issued' a copy of this photo to every member of our family as well as several friends and it was to be found upon a thousand mantelpieces the length and breadth of the country and I dare say the World. Visitors would see it and say "Oh you have a copy of the photo - so have I". It was a short step from there to referring to it as THE photo and finally THE PHOTO. I actually have in my possession the jersey my brother is wearing in THE PHOTO which I guard as jealously as I would a nail from the one true cross. It has I am certain miraculous healing powers. DP is when computers are used to hold a ship within a very small footprint using computers, sensors and thrusters. This is an 8mm film probably made about 1975 - filmed at 122 Norwich Road Wroxham, Salhouse Broad, Norwich Airport and Waxham. It has clips of Billie (Suzanne Buchanan), Thomas Buchanan, Richard Collinson, and Sandy, Chunky and Judy.